The event includes a panel discussion by Enterprise AR companies, customers, and industry analysts and will be held at Atheer’s office in Santa Clara; Atheer is a leading company providing AR solutions for the enterprise. VRARA Members get discount, email info@thevrara.com for your code! AWE (Augmented World Expo) is the world’s leading event series for XR professionals aiming at improving the way we work, live, and communicate via technologies like Augmented Reality, Mixed and Virtual Reality, Smart Eyewear and Wearable Computing, as well as gesture, sensor, and tracking devices. Now in its 10th year, AWE USA will take place on 29-30 may in Santa Clara, California. It's time to move beyond the hype and unleash AR and VR’s potential for training and education. 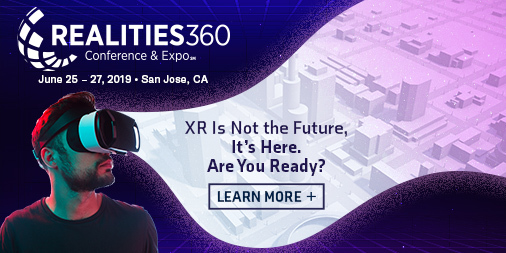 2019 Realities360 Conference & Expo is the event for those looking to build, buy, apply, and explore augmented and virtual realities in their work. You can choose from 50+ sessions showcasing how organizations are actively leveraging XR technologies, explore ground-breaking keynote sessions, and build the knowledge and skills you need with hands-on learning experiences. Plus… New this year is the Realities360 Expo, your one-stop shop to find the products, services, and partners you need to support your AR/VR strategy. See you in June at the tech hub, Silicon Valley, for the premier AR/VR event for training and education. VRARA Members get 25% discount. Email info@thevrara.com for your code. GTC is the premier AI conference providing training, insights, and direct access to experts on the hottest topics in computing today, which of course include AR and VR. Check out the list of AR/VR sessions here. Join us for interactive discussions and demos covering Web-based VR/AR, how they are being used, and implications for the VR/AR ecosystems. The event includes a panel discussion by industry experts covering all things WebXR. The event will be held at 8th Wall’s office in Palo Alto*. 8th Wall is a key company driving WebAR development. *8th Wall's office is a 5 minute walk from the California Avenue Caltrain Station in Palo Alto, and there is plenty of nearby street and garage parking.